TabView is a hybrid component that is made of a multiview and a tabbar. TabView allows quickly initializing a MultiView with a built-in ability to switch between the views. It also features dedicated methods to add and remove views together with the corresponding tabs. There's no need to create a MultiView and add switching buttons for it. 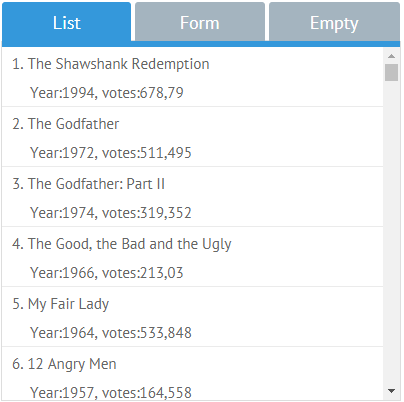 Everything lies within one and the same TabView widget with the cells property that contains collections of views. body - a configuration object for the widget that is placed in this cell. Note that switching between views is enabled automatically via the Tabbar control. For more customization, use the Multiview widget and choose the needed switching method. These configuration objects may contain native properties of multiview and tabbar that need to be redefined. If the configurations are omitted, default values will be used. All the API methods, events and properties of ui.tabbar and ui.multiview respectively are applicable to these objects. By default switching of TabView tabs is not animated. Since animation is a multiview feature, it can be enabled within the multiview configuration. The animate property may take an object with advanced animation settings. You can learn more about different types of defining icons in Webix in the Icons with UI Widgets article. Closing functionality is a tabbar feature. It's the Tabbar default feature. If the tabs are wider than the available space, some of them are pushed to a popup list and can be reached through the related menu. More details are given in the dedicated documentation article. 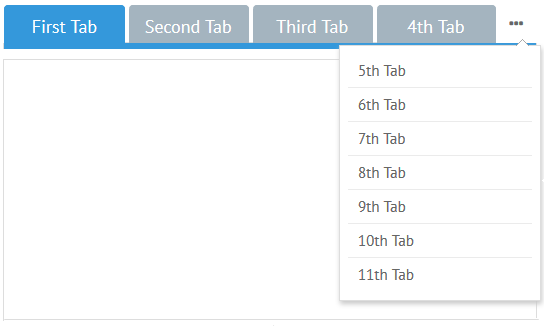 If tabs are of different width and height, Tabview takes the size of the active tab. The functionality is described in detail in the Adding and Deleting MultiView Cells Dynamically article.